Welcome to Tawana Thai Restaurant. For more than 20 years Tawana Thai has been serving the Bayswater/Queensway area with the finest cuisine Thailand has to offer. 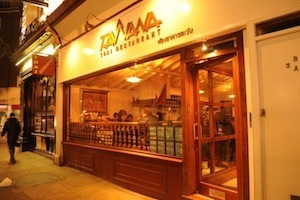 Established at the end of one of the most renowned streets in the Notting Hill neighborhood, Tawana Thai really is a gem that stands out amongst the diverse range of dining experiences the area has to offer. We are located right under the nose of the famous Whiteleys shopping complex and its historical dome. After a hard days shopping and sightseeing of the local atractions London has to offer why not treat yourself and your friends and family to a truly authentic Thai dining experience, all within easy reach from the surrounding areas. Our warm-hearted and experienced waiters and chefs are always ready to welcome your company to our tranquil retreat away from the hustle and bustle of the local streets where you and those around you will be indulged in the exotic yet pleasurable taste of Thai cuisine. The restaurant is adorned in such a refined and cultural manner that even the most bona fide Thai individual would be in awe by the way the Thai artifacts and crafsmanship are attractively presented throughout the restaurant. All the items you will be graced with are genuine works of Thai artistry shipped all the way from their ancestral homeland using only the finest materials Thailand has to offer. Whether you are vising by yourself or with a sizeable party we at Tawana have the what it takes, and more, to present you with the best possible Thai dining experience the locale has to offer for miles around. You are assured to leave with a new found love for Thai cuisine and to be coming back for more; maybe even a trip to the birthplace of this wonderful cuisine, Thailand. The restaurant is the most tranquil place to enjoy authentic Thai food away from the hustle and bustle of the local area. Whether you are visiting by yourself or with a party of friends, the mouthwatering food and friendliest service will always be here to welcome you. We are pleased to offer a second to none takeaway service. Spend £30 or more on food & get 2 bottles of Chang Beer absolutely free! Just mention this offer to the operator when placing your order and get your Chang Beer free of charge. *Offer only applies to takeaway (while stocks last). © 2012 Tawana Limited. All rights reserved.